As a kid we used to trade Baseball Cards in the school yards. Then as you got older it might have been stamps or even coins if you had some money. I know that my mom would give us a quarter to ride the bus to our boy scout meetings but we would all walk and buy more Baseball Cards with the money. I wish I had those cards today. 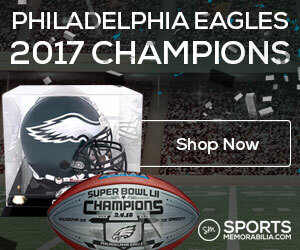 I was just going thru some of the things they have in Memorabilia of the Super Bowl, each player has their own signed Jersey’s, Helmets, Pictures, Balls, Bats and what ever you could think of for the Winners. And MVP’s. Awesome, Come and Get It Now. As we grow up our interests change from season to season. Now we have Football, Baseball, Basketball, Soccer, Golf, Hockey and many more through out the seasons. All these sports have their own affiliate shops for all kinds of things. Here we have the Official Memorabilia Shop. February 4, 2018 which follows the 2017 regular season. This game was originated between the NFL and the AFL and agreed that the 2 league teams would have a playoff game called The World Championship Game. This merger officially began in 1970. Now when the Super Bowl is played, it is considered an unofficial holiday which is now called Super Bowl Sunday. As the football season is on its way, we all have our favorite teams to go crazy for. If we are lucky enough to get to see some of them in the stadium, most of us would like to wear the teams, Sweatshirt, Jacket, Jersey or Hat. Some kind of accessory when at a home game rooting for our favorite teams. Well this is the place to get all the teams accessories with your favorite players number, name and team. Who do you think will take Super Bowl 52? This year we all want to see the games played without anyone getting hurt. We all go to a game to enjoy ourselves and maybe bring a friend or child and do not want to get involved with the other fans……… except for cheering our favorite team on to win. Do you think the Giants are going to win this year? Who is going to win this years Super Bowl? Don’t look like the Giants are going to make it right now. The Giants are an American Football Team now based in MetLife Stadium in East Rutherford, New Jersey. They joined the NFL 1925 and out of the 5 teams who had joined is the only one left. The team ranks 3rd among all the NFL franchises with 8 NFL titles. They are only beat by the Green Bay Packers who hold (13) titles and the Chicago Bears who hold (9) titles. I guess that by this time, you know that I am a Giant fan. But it doesn’t matter what team you are rooting for the Sports Memorabilia Shop has all the accessories for any team you would like at discounted prices most of the time. At this time there are over 103,500 products to choose from. In Conclusion: Hope everyone is rooting for the Right Team this year.